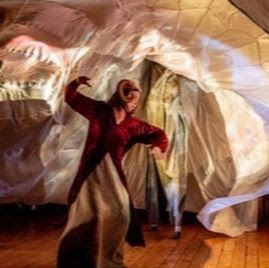 Double Edge Theatre will present its performance Leonora & Alejandro: La Maga y el Maestro April 5 through 14 as the kick-off event of DE’s 25th Anniversary Celebration of the founding of its Farm Center in Ashfield, MA. This performance premiered at the Peak Performance Series at Montclair State University and was chosen as a Critic’s Pick by the New York Times. Drawn from the art and life of British-born Mexican artist Leonora Carrington and her mentorship of the Chilean Jewish filmmaker and writer Alejandro Jodorowsky, this surreal performance is steeped in magic and reveals not only the alchemical melding between great seers, but also their spiritual tug of war. Conceived and directed by Stacy Klein. This is the final chance to see this performance locally, before it begins to tour nationally and internationally next year. Seating is limited. A last chance to see this piece in our barn before our 2020 Tour. Drawn from the art and life of British-born Mexican artist Leonora Carrington (Jennifer Johnson) and her mentorship of filmmaker/writer Alejandro Jodorowsky (Carlos Uriona), this surreal performance is steeped in magic and reveals not only the alchemical melding between great seers but also their spiritual tug of war. Conceived and directed by Stacy Klein. 1:00pm: A discussion on women’s alchemical, magical, and spiritual creation process, and how this approach often remains hidden. Featuring Susan Aberth, Morgan Jenness, Stacy Klein, Baraka Sele, Sherina Sharpe, and others. is the name Nipmuc Elder and award-winning writer, poet, cultural educator Larry Spotted Crow Mann gave to programming planned for the Voices of Native Youth. Learn more during community weekend May 4th & 5th. Come celebrate Double Edge’s vibrant community members, artists, and partners who have created and contributed to the last 25 amazing years at the Double Edge Farm in Ashfield. Fly on bungees, sing and play music, and learn about DE’s Ashfield history and ongoing renovation and preservation of the beautiful Farm! The day will culminate in a gathering and meal, sharing testimony, and honoring the extraordinary Living Culture in Ashfield. Double Edge Theatre, an artist-run organization, was founded in Boston in 1982 by Stacy Klein as a feminist ensemble and laboratory of actors’ creative process. The Double Edge Ensemble, led by Klein, along with Co-Artistic Directors Carlos Uriona, Matthew Glassman and Jennifer Johnson, and Producing Director Adam Bright, creates original theatrical performances that are imaginative, imagistic and visceral. These include indoor performances and site-specific indoor/outdoor traveling spectacles, both of which are developed with collaborating visual and music artists through a long-term process and presented on the Farm and on national and international tours. In 1994, Double Edge moved from Boston to a 105-acre former dairy farm in rural Ashfield, MA, to create a sustainable artistic home. Today, the Farm is an International Center of Living Culture and Art Justice, a base for the ensemble’s extensive international touring and community spectacles, with year-round theatre training, performance exchange, conversations and convening, greening and sustainable farming initiatives. DE facilities include two performance and training spaces, production facilities, offices, archives, music room, and 5 outdoor performance areas, as well as an animal barn, vegetable gardens, and two additional properties: housing in the center of town for resident artists and DE’s Artist Studio giving primacy to underserved artists; and a design house, with design offices, studios, costume shop, and storage for sets, costumes, and props. A vision of future facilities includes a public archive/gallery, a fully developed farm, and Ohketeau (meaning to plant something, to grow), a meeting space for the voices of Native youth.